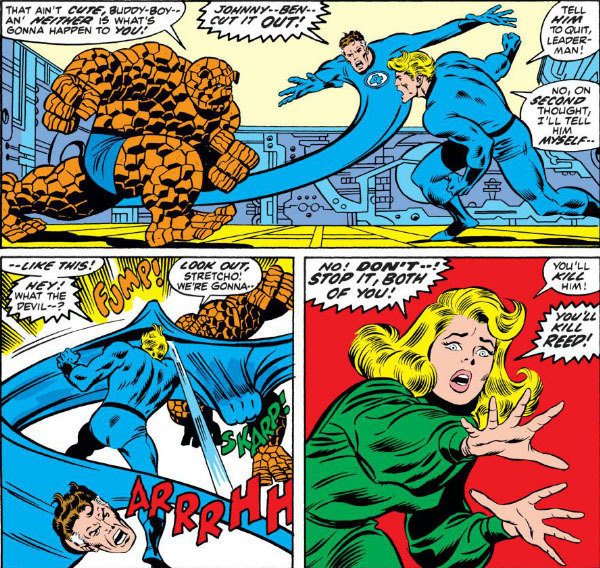 One of the things I appreciated in John Byrne's stint on Fantastic Four was his occasional nod to the Lee/Kirby gift for connecting fans to the FF in ways other than just the stories. The fan mail. 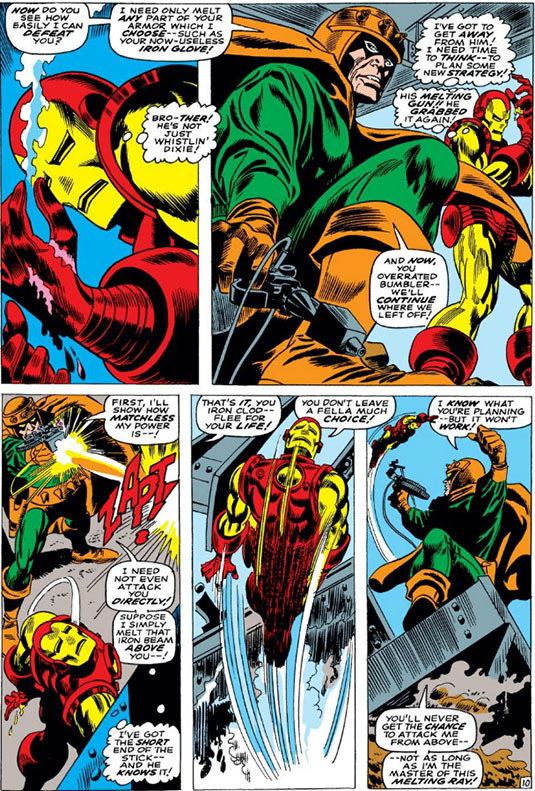 The "rogue's galleries." The pin-ups. The various inserts which told you a little more about the characters. 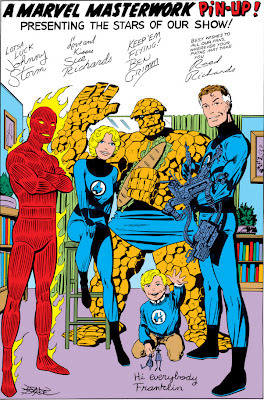 Instead of a dynamic "charging into action" pose that we see so often in team art spreads, each of these pin-ups is presented in a family snapshot pose that comes across as more inviting to readers/fans. You feel like you're a part of the FF's world, rather than just looking at it by turning pages. 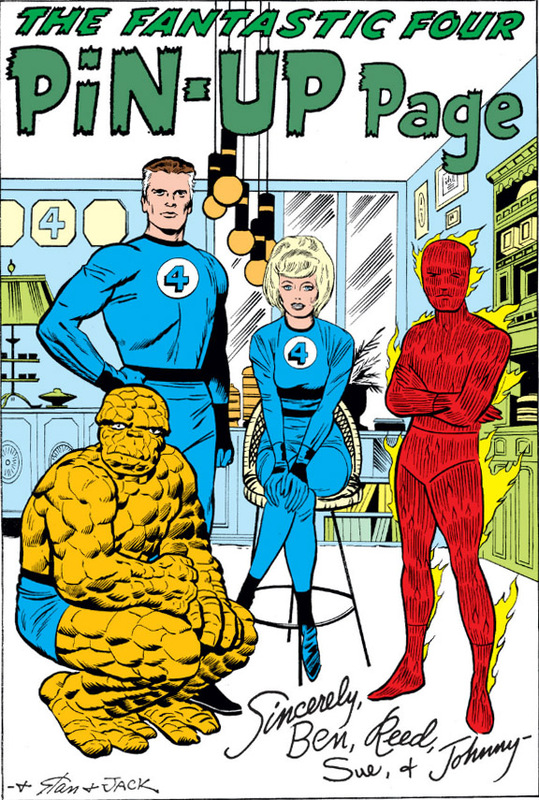 That's helped a great deal by the simplicity of the room the FF are gathered in--and also the fact that they're looking directly at you in greeting, as well as including their personal autographs to you. They were unexpected treats to a kid reading comics--you felt like part of the adventure. 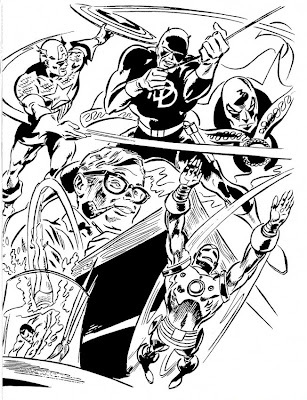 Byrne obviously, and interestingly, interprets the characters differently in his rendering. 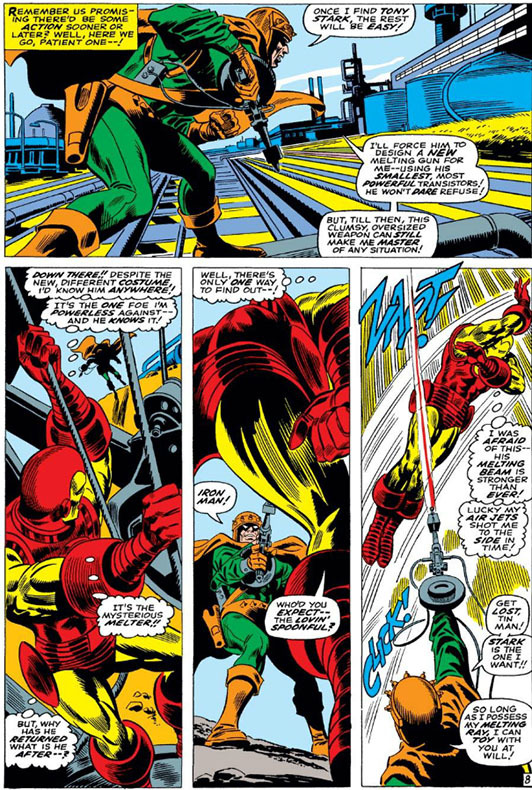 Kirby, for instance, sees Reed as a bolder figure, the unquestioned leader and decision-maker, with a build to match his drive. 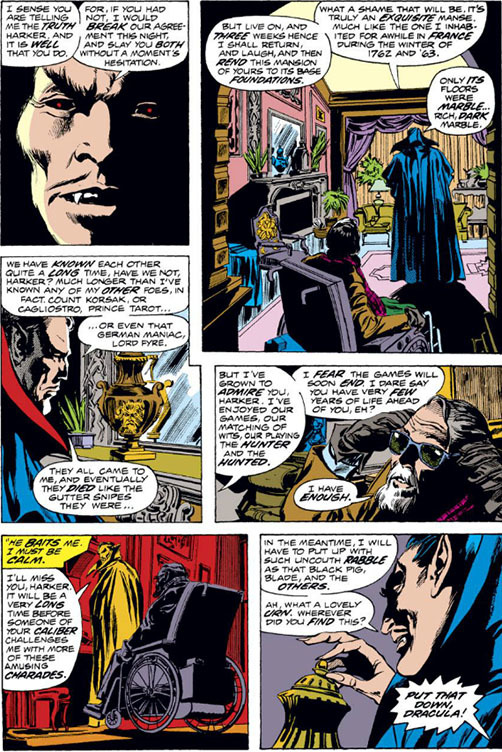 In Byrne's portrait, Reed is far less built, more cerebral--and he tends to blend with the other members of the group, rather than stand out. 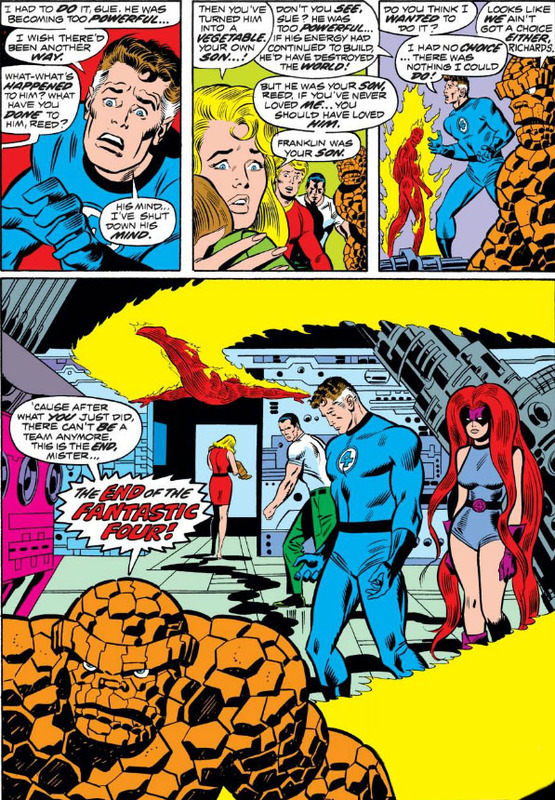 Sue portrays a picture of loveliness in both portraits, though seems more animated and engaged in Byrne's drawing. Johnny, all of 16 in Kirby's pin-up, is still Sue's kid brother in Byrne's, but seems more of age than the boy that Kirby presents to us. 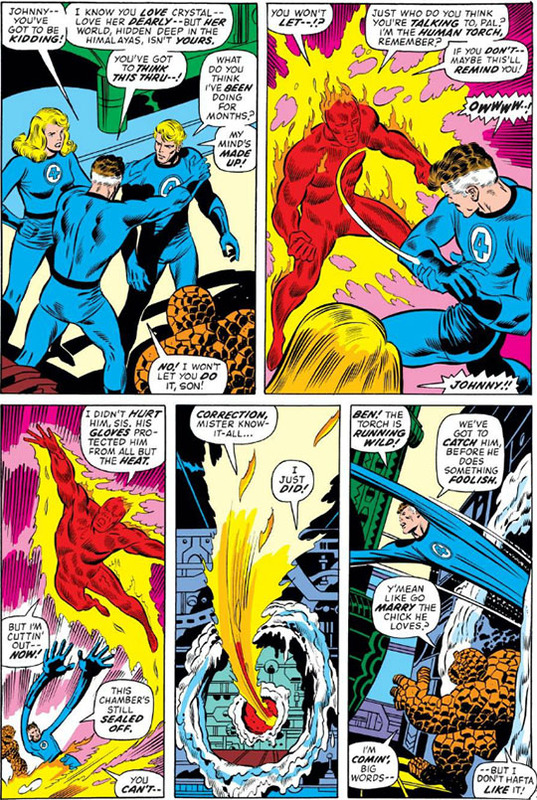 And the difference in Ben is striking--larger, more protective in Byrne's pin-up, his stature more in line with the kind of power he's been shown to possess. Byrne also gives us individual messages with the autographs, where Kirby felt signatures would suffice. 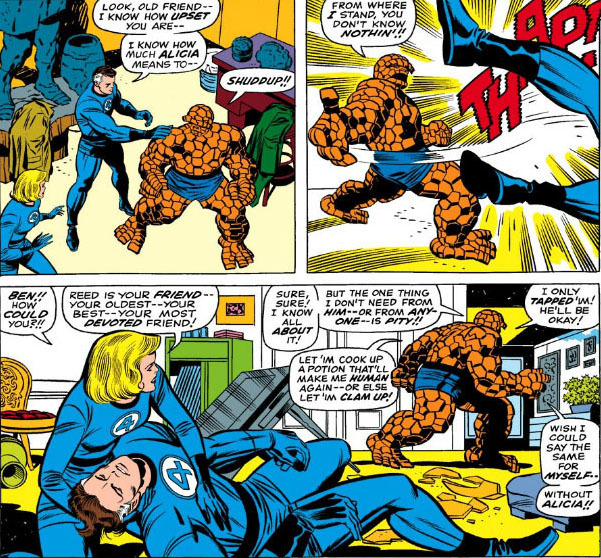 And the addition of Franklin was a nice touch, though of course that's no oversight on Kirby's part. 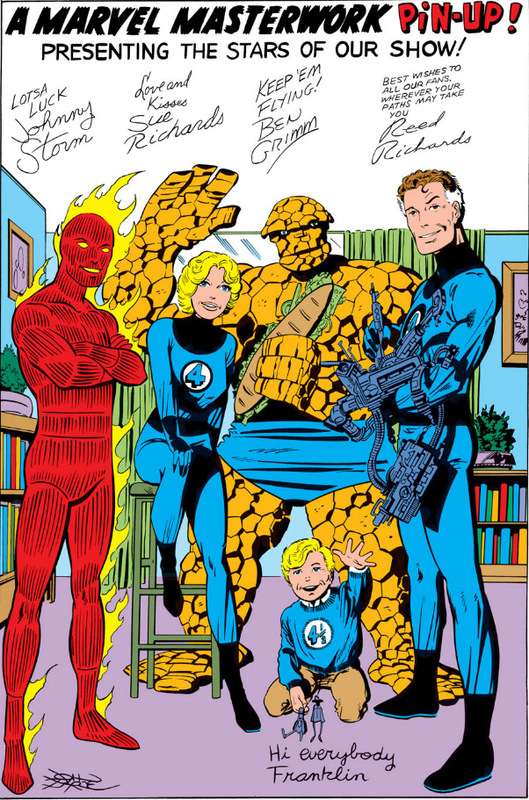 Being the close-knit, mostly related group that they are, I suppose only the FF could get away with this kind of "welcome to our home" pose. Since they've had more than their share of action shots, these pin-ups were a good change of pace, and served to add a little dimension to the team. I'm not sure when a writer on Fantastic Four first called the team a "family"--but I do know that it was an observation that went unspoken for quite awhile. 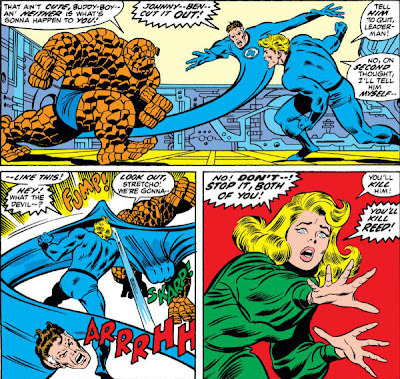 It's an observation about the FF that was hiding in plain sight. After all, dissension in families crops up often, though "dissension" can often be an understatement in describing family arguments. 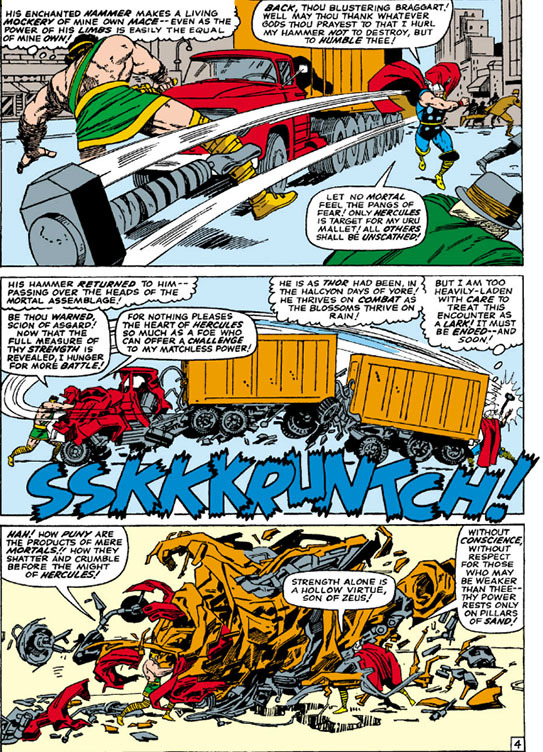 Add that kind of simmering powderkeg to a "family" with super-powers, and someone storming out the door can be acted out almost literally. 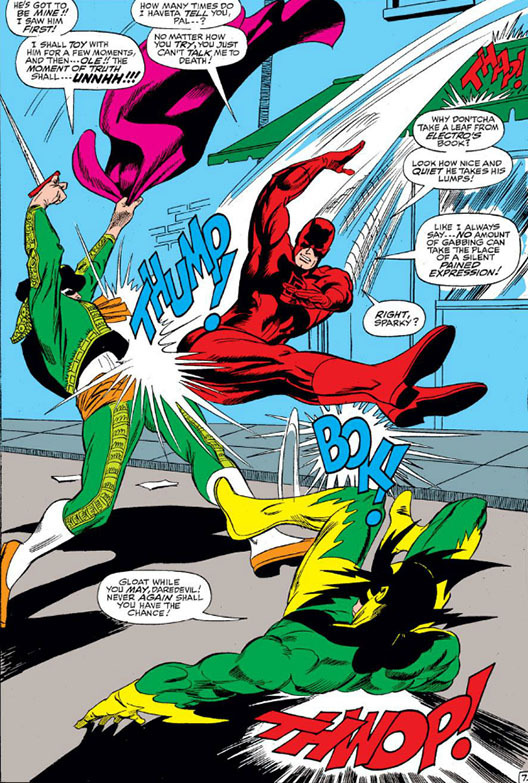 For instance, we've all had family disagreements where push comes to shove--but did you ever have one like this? 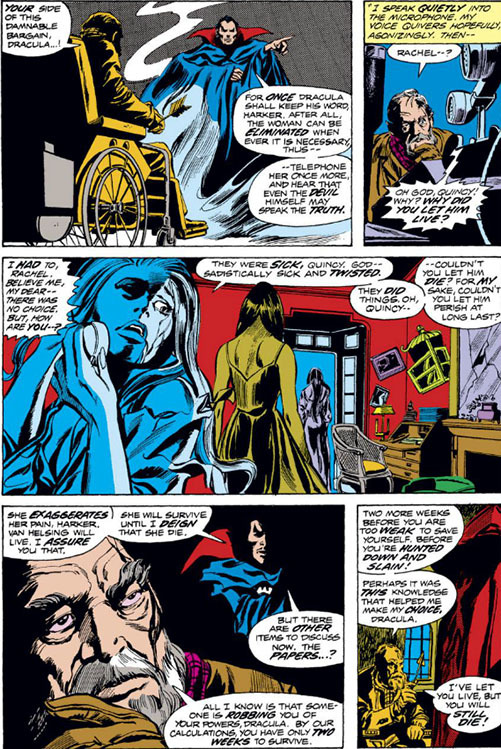 So the FF are what you might call a special case as far as family disagreements are concerned--a case that even Dr. Phil would probably steer well clear of. Because while these four are well known for their intra-team bickering at times, there are often instances when things reach the boiling point. 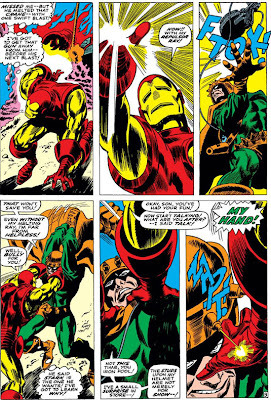 In both of these instances, Reed is caught between a rock and a hard place--the tactical vs. the human. I know which way the respective stories are tugging me--but I can't invalidate his point of view in either instance. 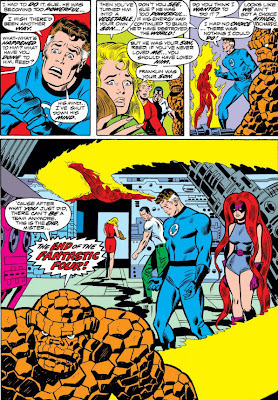 I suppose that would disqualify me from FF membership if it were up to Sue, Johnny, or Ben. 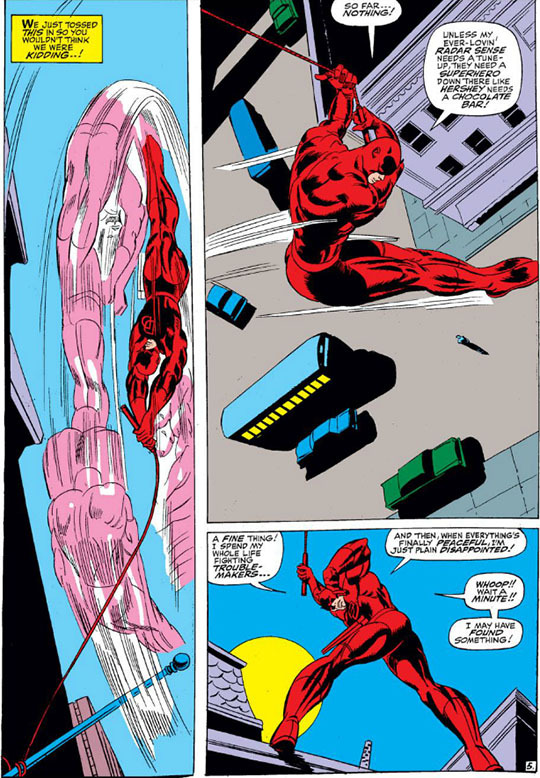 It's probably a good thing these four had the multi-floored Baxter Building as their headquarters--look at all that space they had to get away from each other when they needed to. But despite the portrayal here, the flare-ups between members of the FF have been the exception rather than the rule. 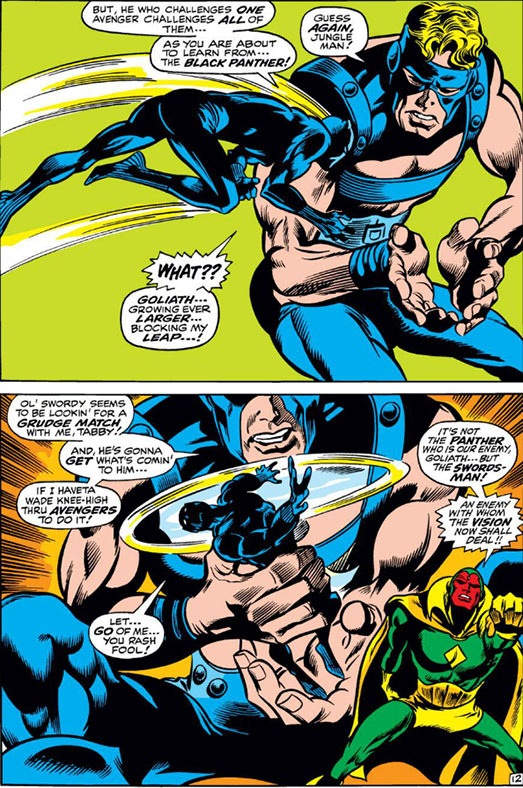 Whatever arguments they've had have helped them to understand each other better and pull together more strongly. 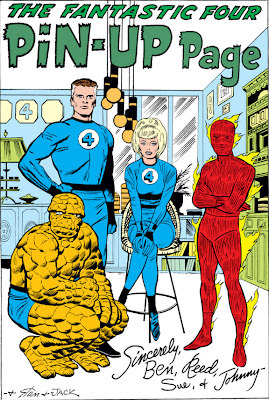 I remember an old segment in one of the FF annuals called "Questions and Answers About the Fantastic Four," where each team member had their own short Q&A list--and one of the questions about Johnny was, "Does he really hate the Thing?" 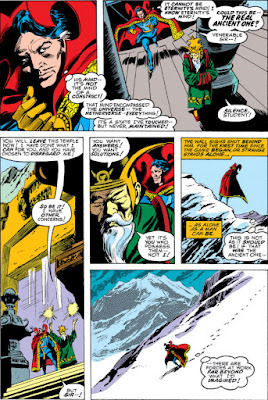 And the answer, short and sweet, was "He'd risk his life for him without question!" 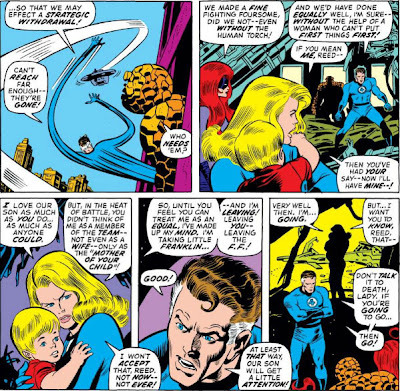 That sentiment may not always hold true in our real-life families, but it's one of the qualities that made Fantastic Four one of the more memorable teams in comic books. 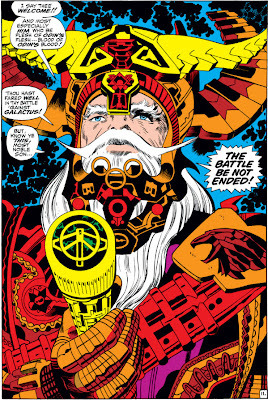 Among the many full-page portraits that artist Jack Kirby devoted space to in the comic books he pencilled, his most detailed often involved those he drew for Thor. And among those, who better to dote on than Odin, whose status as ruler colored practically his every mood and expression? Yet there were other artists who found Odin irresistible for full-page coverage--most notably, John Buscema and Neal Adams, the latter having only a short tenure on Thor but who left a memorable impression. 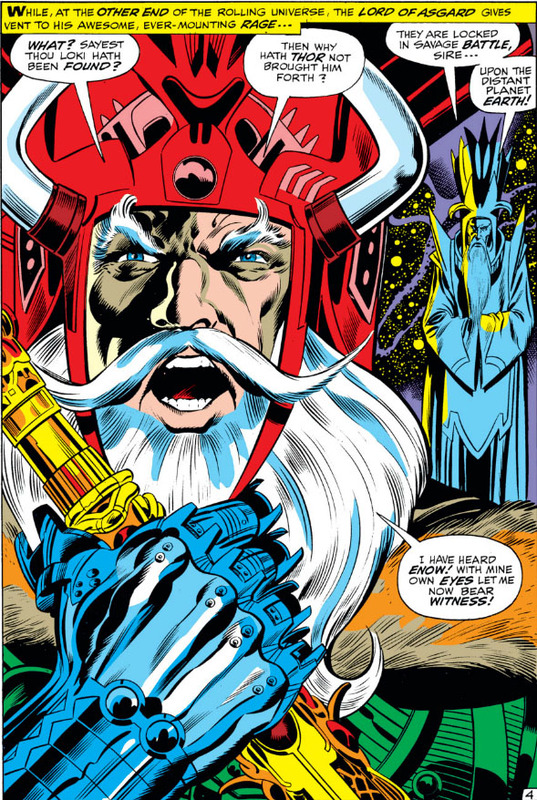 Here, then, is a comparative look at the lord of Asgard, as seen through the eyes of those best able to interpret him--Jack Kirby, Neal Adams, and John Buscema, respectively, giving him the full-page treatment. And you'll probably agree that even an entire page can barely contain him. 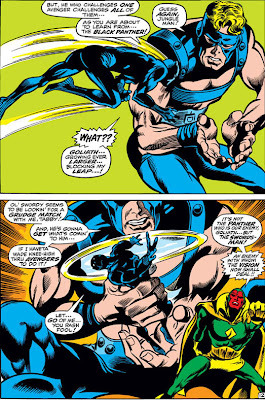 Before Marvel Team-Up and Marvel Two-In-One came along and milked the concept for all it was worth, Marvel would occasionally concoct unlikely match-ups between its characters within their own titles--meetings which would make you scratch your head and wonder whatever made the writer think of having these two characters meet at all, much less fight. 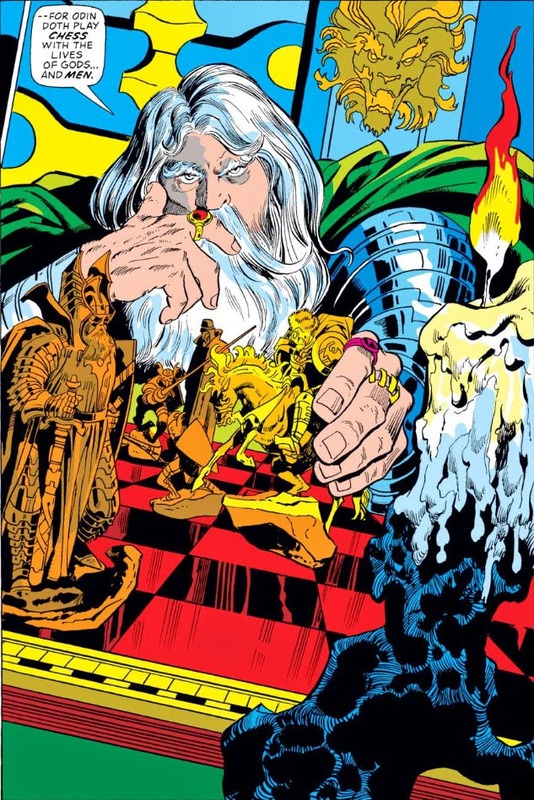 But your curiosity got the better of you--you wondered how the battle would play out, no matter how mismatched the characters were in abilities. 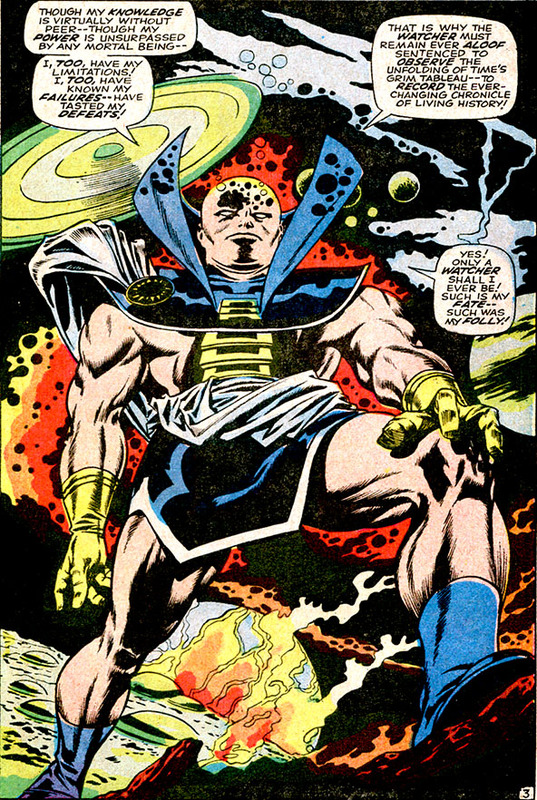 Would might or power triumph? 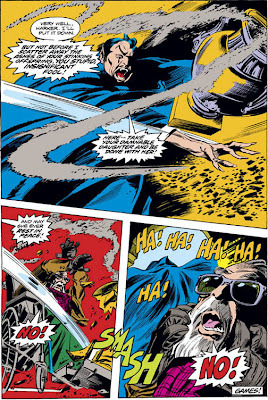 Or would cunning and tactics win the day? No, you're not seeing things. Spider-Man--humbled by hair. Like life wasn't already kicking him in the shin. As relatively tame as their first conflict was by comparison, this second meeting of Thor and Hercules will have you thinking that all-out war has broken out between them. That's probably due more to marketing than their own temperament. This issue marks the point where Journey Into Mystery, the title that had introduced Thor and continued publishing his stories as a series, formally shifts its name to The Mighty Thor, with the issue number picking up where Journey Into Mystery left off. 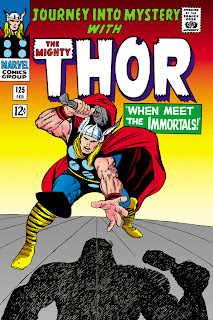 Not giving Thor his very own #1 issue would later come back to bite Marvel from a marketing standpoint, but I think I can see the thinking here in wanting to retain regular readers of Journey Into Mystery while simultaneously bringing them on board the Thor title; also, for whatever reason, it may have seemed a little odd to them to "restart" Thor at #1 when he's already had a run of over thirty issues. 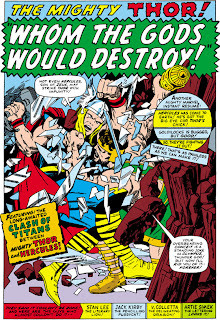 In any event, with Thor's "first issue," Marvel no doubt wanted it to explode onto the comics racks with a bang, which was billed as a "clash of titans." And, indeed, that's just what artist Jack Kirby delivers in this cover-to-cover brawl. 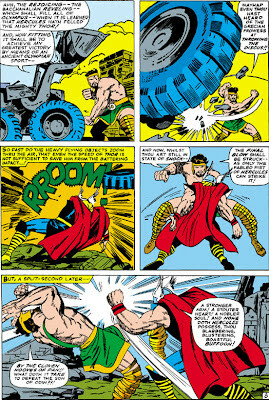 Hercules, of course, had no way of knowing that he'd thrown the wrong punch at the wrong time. 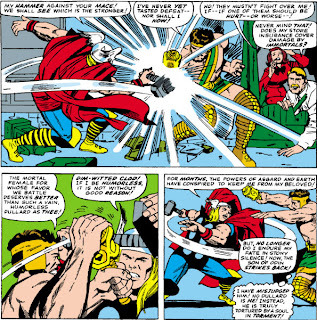 Thor had just undergone the Asgardian "ritual of steel," where Odin basically sics the entire complement of Asgardian warriors on a subject who's displeased him--in this case, Thor, who has kept from Odin the fact that he's revealed his secret identity to Jane and declared his love for her. 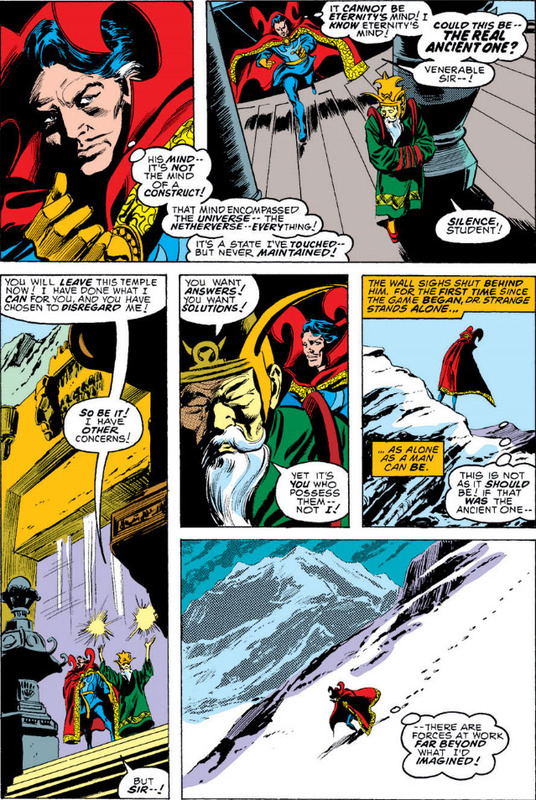 (Yeah, I know--most fathers don't hurl armed legions against their child when they don't agree with what they've done--but Odin isn't exactly your typical poster father.) Nor is Jane entirely blameless here. 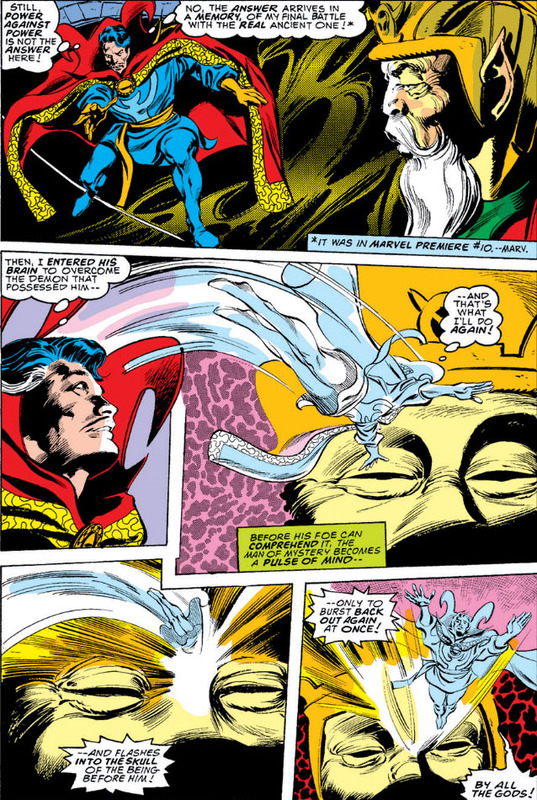 Despite pulling an often-resorted-to mortal tactic used with inattentive boyfriends, she forgets she's dealing with--let me see if I can say this clearly--GODS. 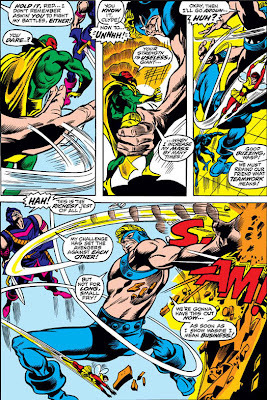 So chances are, things aren't going to end at macho threats being hurled. 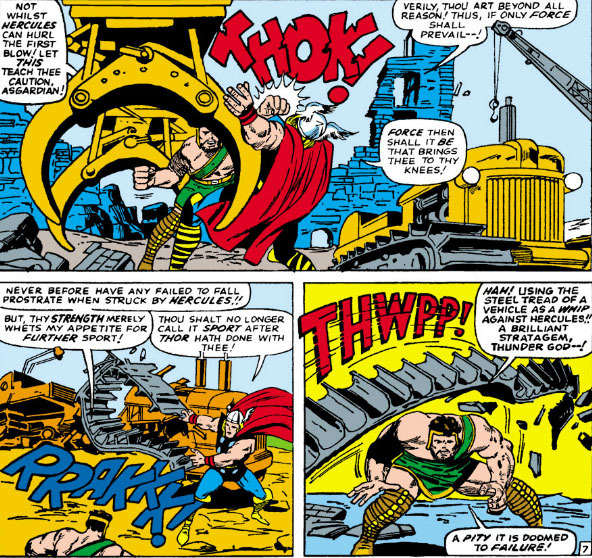 In fact, Jane, things just might end with a large part of New York City being reduced to rubble around you. Nice going, dear. 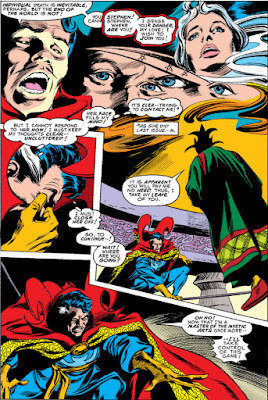 Astonishingly, you actually have the nerve to look shocked in that last panel. 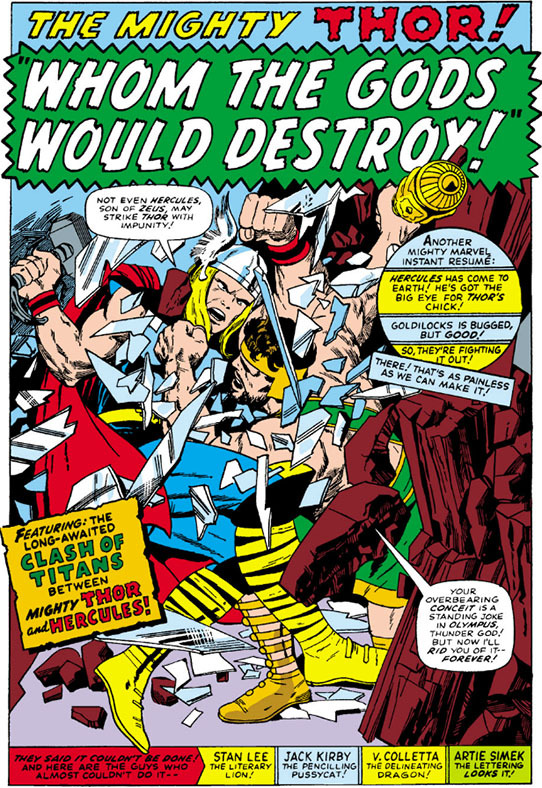 You may have noticed that Thor has become more clear-headed as the fight has progressed, given how frazzled he was at having escaped Asgard and fighting his way back to Jane's side. 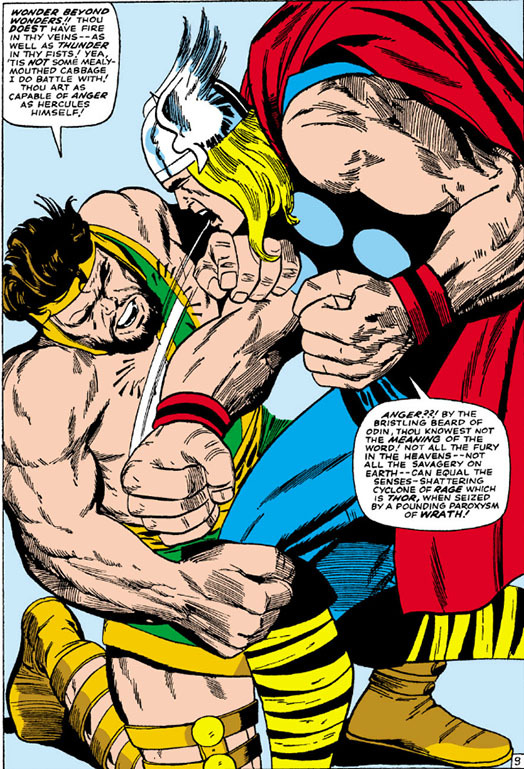 At that time, Hercules had basically pushed him too far after all he'd been through--and in addition to Jane's manipulation, Thor probably found responding to Hercules the perfect way to release his pent-up anger at Odin's pig-headedness, if only subconsciously. 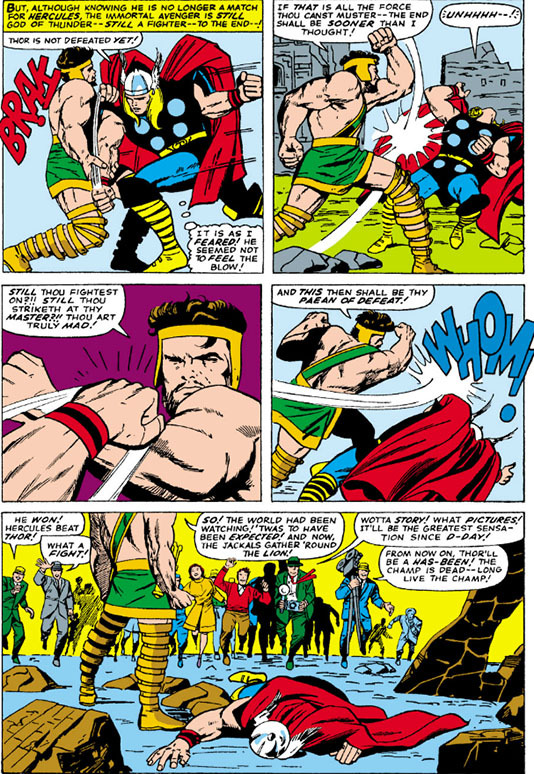 Yet now he's come to see a lot of himself in Hercules--before he'd found his center as Donald Blake, before his time as an Avenger, before he'd become so endeared with mortals and their circumstances. Unfortunately, Hercules' persistence isn't allowing his own thirst for battle to subside. That last page is yet another of Jack Kirby's beautiful full-page portraits that he often inserted into his later work at Marvel. 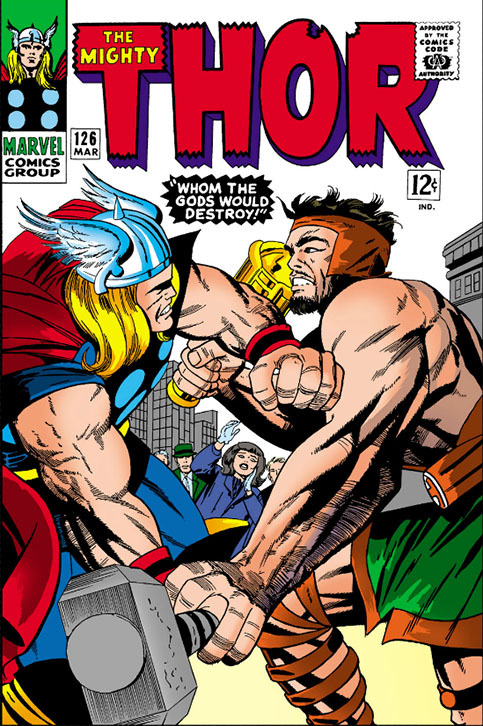 This would be the last Thor-Hercules battle that he would ever illustrate before his departure from the company (aside from a cover illustration here or there). 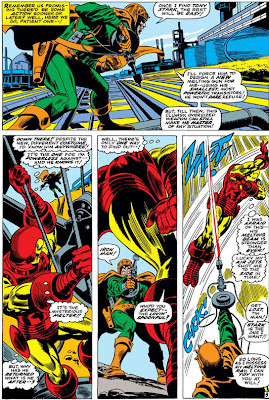 The difference in pacing between this battle and the earlier one is remarkable--though some of that is due to the battle taking place not on a grassy field, but in the midst of contemporary building structures, the shattering of which is more conducive to displaying pacing. It's regrettable that the battle now begins to draw to a close--because Odin, in his often-questionable wisdom, has decided that now is the time to punish Thor for his transgressions, by removing half of his power. And the tide of battle instantly turns. It takes awhile--and cannily, on Marvel's part, more book sales--for things to be resolved with Hercules and Thor in terms of wrapping up this situation between them properly. 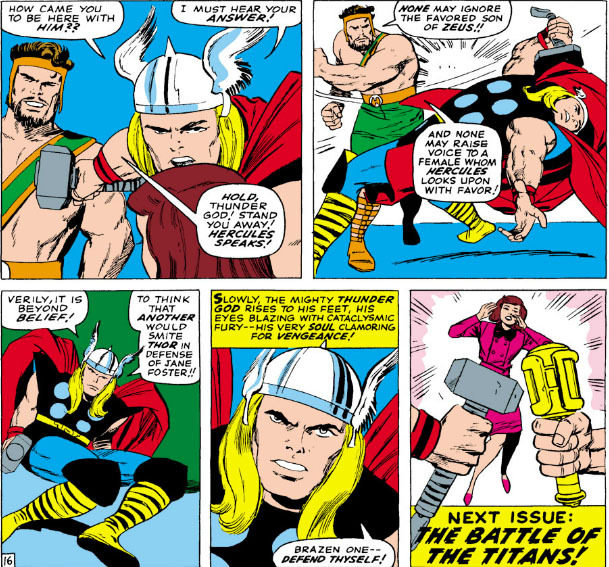 Everyone at this point wants Thor back at his peak and gunning for a rematch--which, in the beginning, is exactly how things start out with Thor and his reconciliation with Odin. 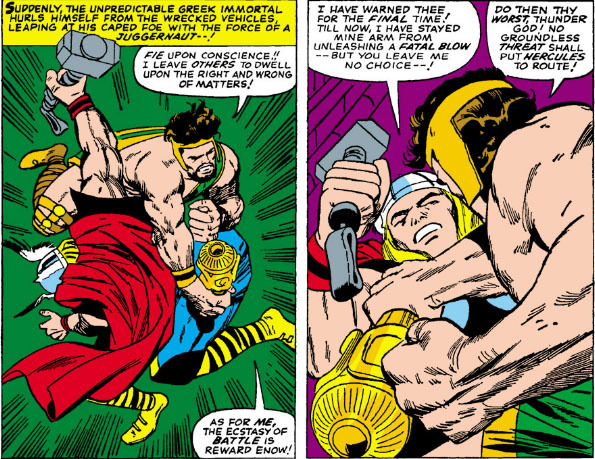 Yet when Thor finally finds Hercules again, he discovers that the Olympian is in dire straits--and we're shown, through Thor's actions, that it's more important to have a sense of honor than it is to carry a grudge. In helping Hercules, Thor redeems himself in a way far more lasting than a thrown punch would grant him--and he forms a better relationship with Hercules as a result. 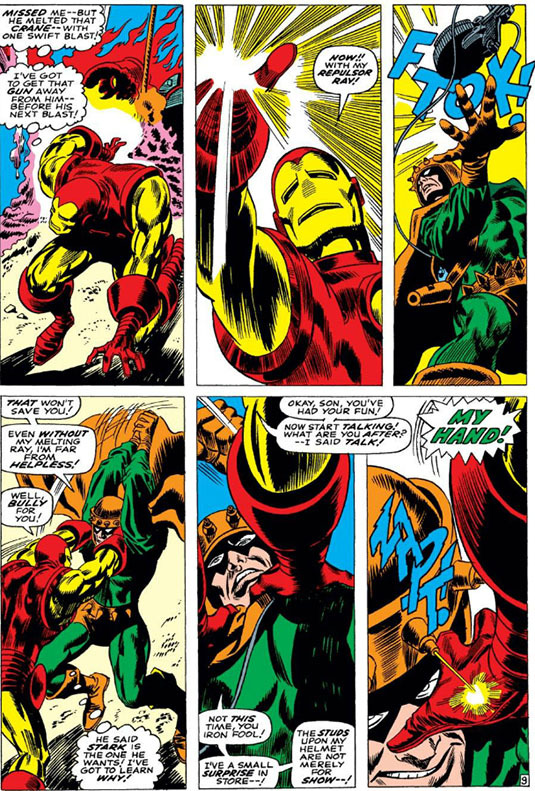 Though if that gives you the impression that these two will never have reason to clash again--well, you haven't been reading comic books very long, have you? 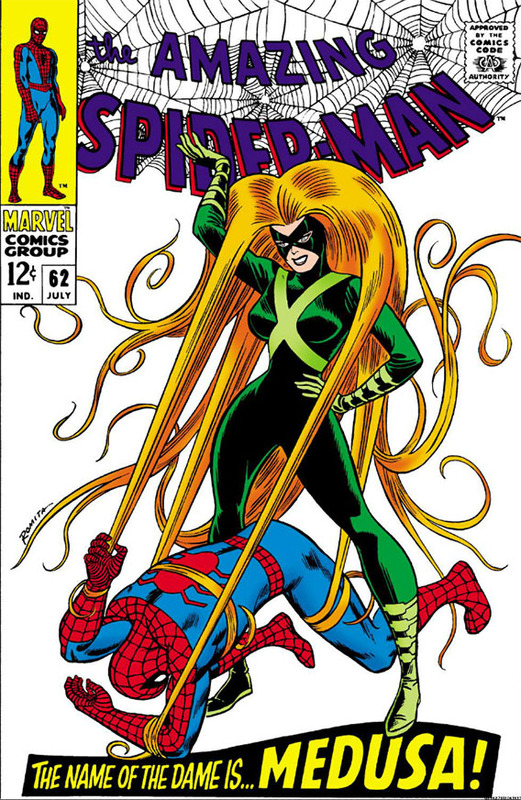 Have a look at some of this artist's memorable work and style.